Psyonix recently made some pretty big announcements about the crossover content between Rocket League and SCS Software's Euro Truck Simulator 2 and Coffee Stain Studios' Goat Simulator. The new updates are set to arrive later this month for the combat sports sim. The news about the new crossover content has arrived courtesy of a post over on the official Rocket League website. They announced that the Euro Truck Simulator 2 content featured in Rocket League will see gamers having the ability to attach Euro truck antennas to their cars. In addition to that, the Octane Battle-Car dashboard toy will be featured in Euro Truck Simulator. The dashboard toy will have some minor physics-based properties after they were introduced in the latest Cabin Accessories DLC pack for Euro Truck Simulator. 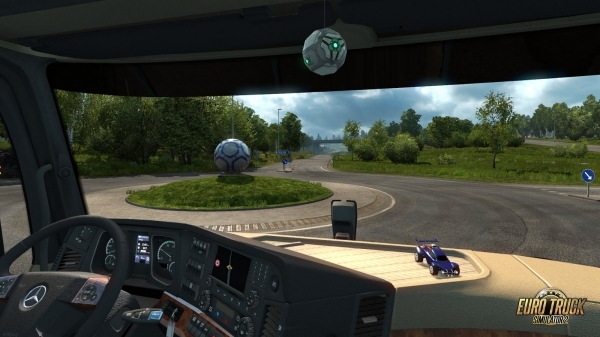 You can see what the dashboard toy looks like in the image below for the truck driving simulator. Additionally, Psyonix also announced that they have some special crossover content with Coffee Stain Studios Goat Simulator. The content will arrive in the next update for Rocket League, allowing gamers to deck out their vehicles with a G2 Robot Atenna and the Goatenna that. This is Psyonix way of repaying the Coffee Stain Studios devs for adding in a “Rocket League” game mode in their Payday DLC. 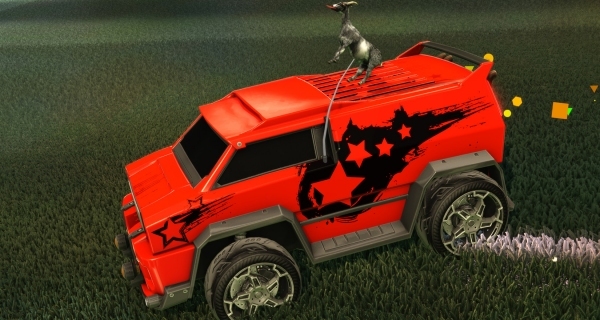 You can scope out the Goat Simulator content in Rocket League with the game screenshot below. Both the crossover updates will arrive in the next big roll-out for Rocket League later in the month. The only thing they don't clarify is if this content will be available for all three platforms or if it will make an appearance on PC first and then eventually come to home consoles. The most common tactic that developers use is updating the game on PC (since they can do this for free) and then proceed to iron out all the kinks, squash all the bugs and ensure that performance and compatibility is airtight before sending in the patch for certification on the PlayStation and Xbox consoles. Given that Psyonix doesn't specify if there will be any disparity in the release of the content between the different platforms, I suppose we can assume that the PC, PS4 and Xbox One will receive the new Euro Truck Simulator and Goat Simulator content simultaneously. You can look for the new crossover updates to arrive for Rocket League at the end of the month. As for SCS Software including the Rocket League content in Euro Truck Simulator 2, you can look for that to go live in an upcoming update for the truck driving simulator. All three games, Rocket League, Goat Simulator and Euro Truck Simulator 2, are available right now so you can get your hands on them for their respective platforms.